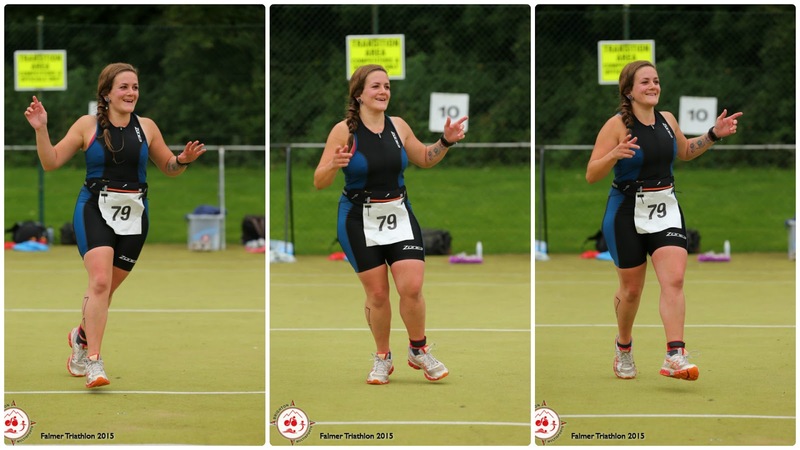 After surviving my first triathlon and sailing home on a wave of endorphins, I gave into my FOMO at hearing so many of my friends were racing Falmer tri just a week later and signed me and hubs both up with gusto. 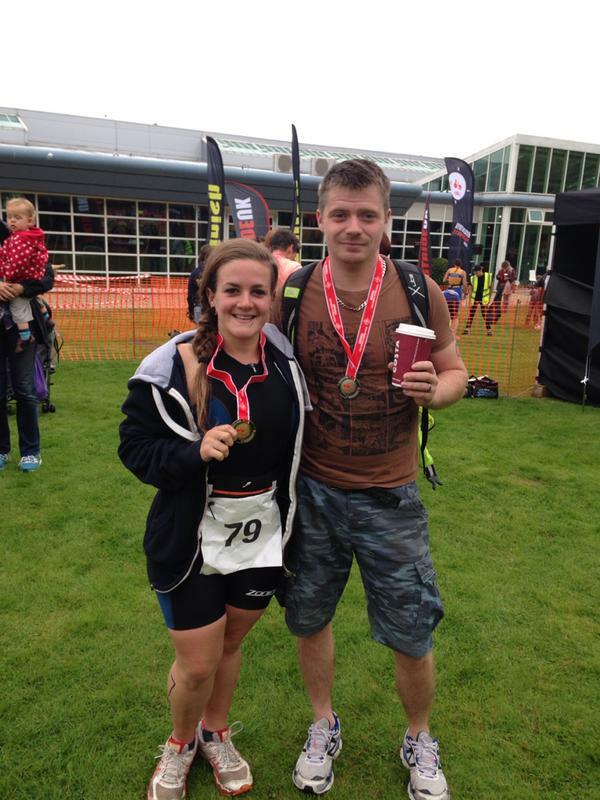 I was slightly out of shape for the hilly bike and run course on this one, and Chris had never done a triathlon, nor trained for one, but is one of those people who can turn up and smash things with minimal preparation, leaving me in a trail of dust. Anyway, I got FOMO when I found out half of Brighton was racing, and then he got FOMO when I said I was signing up, and that’s how we came to be standing on the side of the pool at Virgin Active gym in Brighton, shivering in our trisuits not long after 7am on Sunday morning. 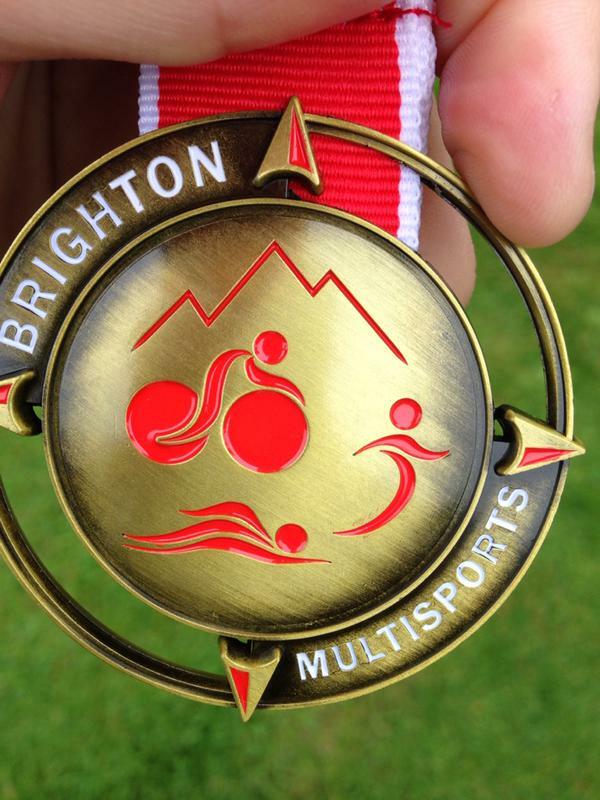 One of the last tri’s of the season, and organised excellently by Brighton Multisports, Falmer is basically just one big jolly for Brighton’s massive and wonderful fitness community. The thing I really love about being active this city is the huge amount of new friends we’ve made and how incestuous it all is (not literally – or it could be, I’m happily married so couldn’t say). Everyone knows everyone and if you don’t, well you do now – welcome to the party. 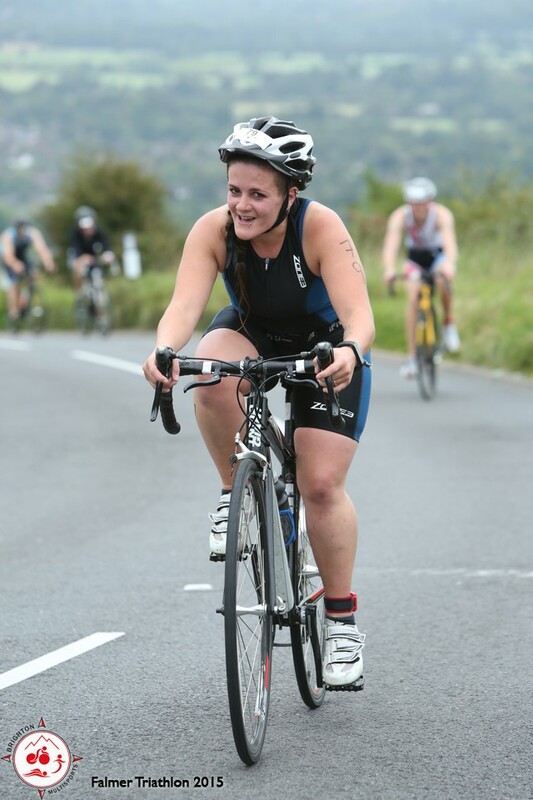 Bearing in mind the previous week’s completely irrational fear of the swim, I wasn’t at all nervous about this race, but instead enveloped in that familiar race day dread about how much the tougher bike and run course was going to hurt. 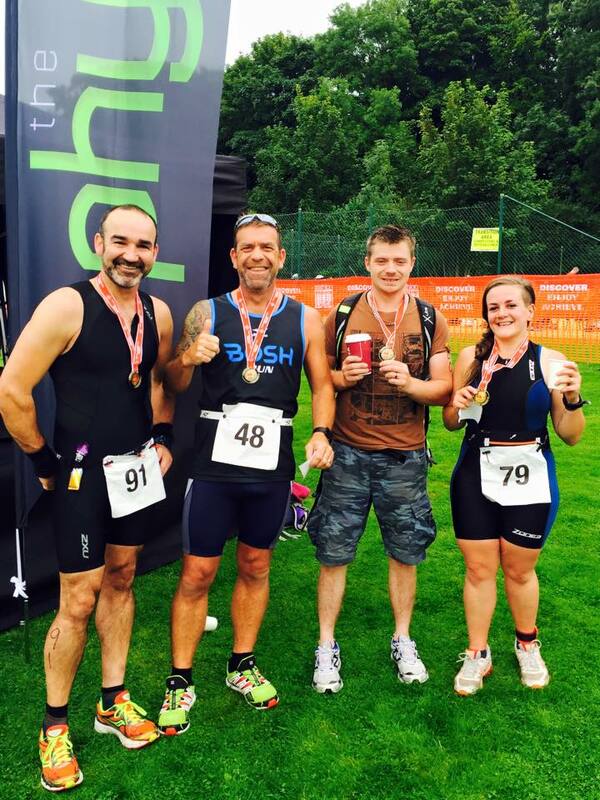 For my first tri I was treated to a short, flat bike and run loop, so could go all out and not risk burning out. 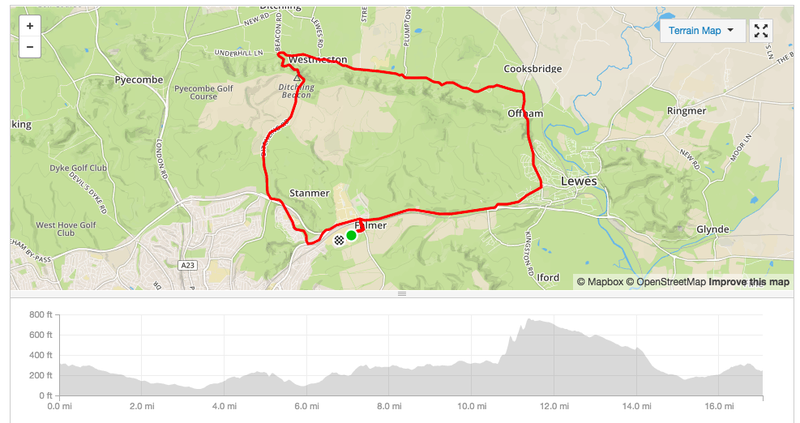 This was different, with the undulating 17mile bike course taking on Ditchling Beacon and the 5k run snaking through hilly Stanmer Woods. 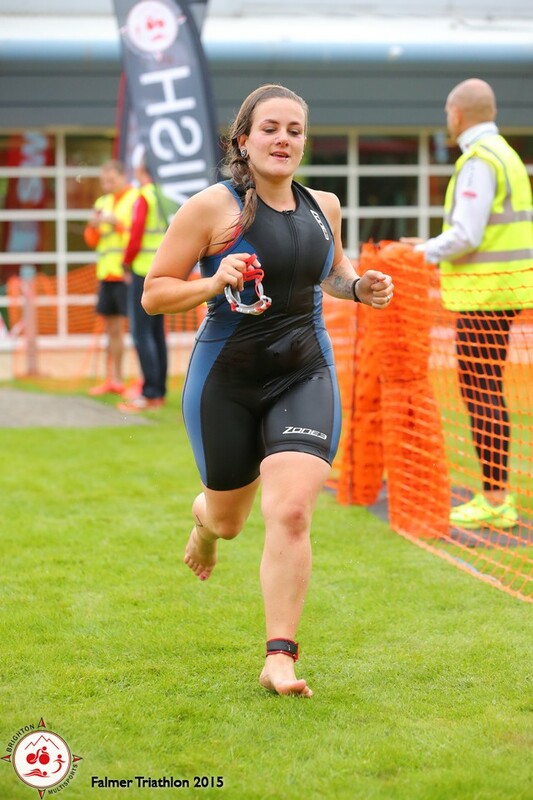 I wasn’t scared of the swim, in fact I was really looking forward to it, once we’d sorted out the mix up with our predicted times (don’t mix this up or they give you an average time of 8 minutes and put you in with the big boys). There are a few great things about this race, which I’ll list below, but one of them is the way they let the slowest swimmers start first, according to predicted swim times. 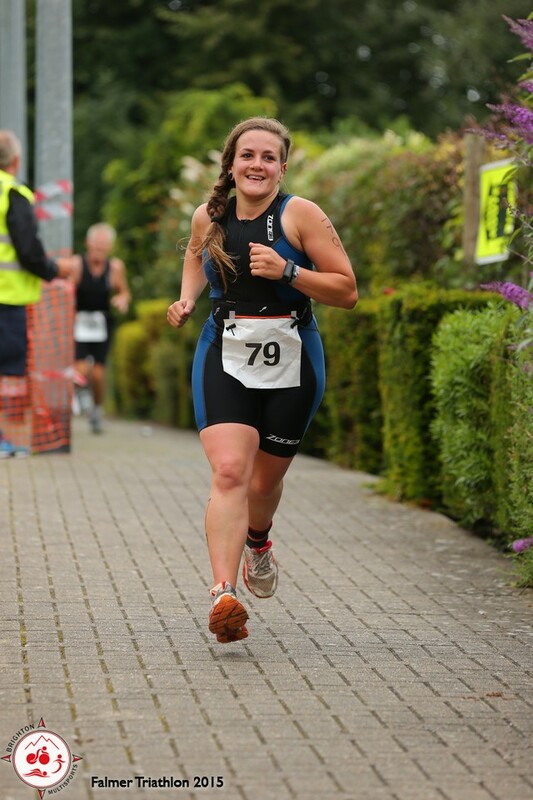 Having the slowest swimmers start first means they get ‘ahead’ on the bike and run and don’t end up being dead last. 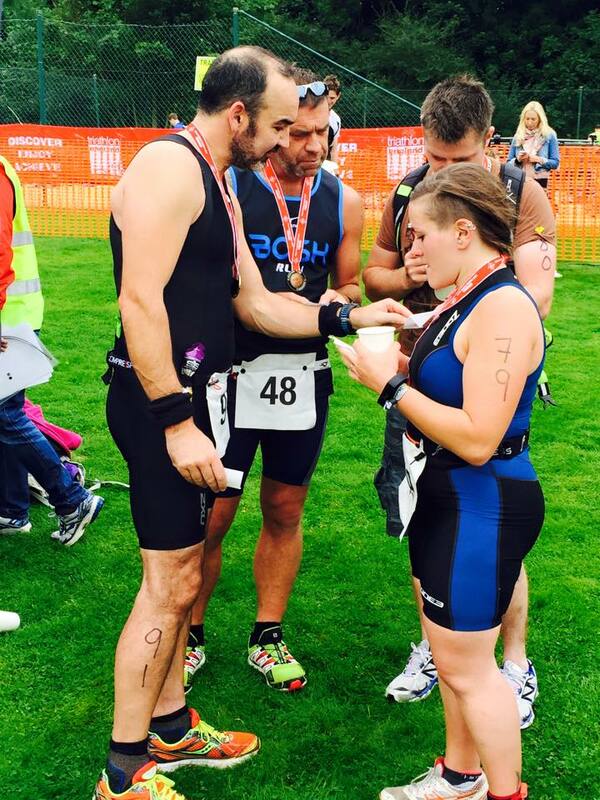 It’s a brilliant way to race as you can’t tell where you’re positioned, and it makes it all relative to each athlete. After jumping to the first wave of swimmers after our timing mixup, I ended up being one of the very first in the pool. The swim felt smooth and long, and everything I’d practiced in training, and I was comfortable in the water, actually quite enjoying myself. The race briefing outlined the etiquette for the swim – if we were tapped on the toes, we had to pull over at the end of the lane and let the faster swimmer go. I got tapped a few times, and the other three swimmers in my lane were all of similar speed so each time had to wait for all three to pass before kicking off again. As such, my swim time wasn’t going to break any records, but I was really pleased with how smooth it went and how it felt. Next year, I’ll make sure I can get in with the 8 minuters and hold my own. Oh and of course, Chris nailed his swim in around 9 minutes, despite his apprehension from not swimming at all for the entire year. Now for the fun bit. This is a course me and hubs have ridden many times, each time with varying success. The little rolling hills on the way to the beast that is the Beacon all add up so I was nervous about burning out and bonking on the big climb. After I’d finished faffing in transition (got a little work to do to catch up with the guy who won a spot prize for his 12 second fleeting visit – 12 BLOODY SECONDS!! ), I finally jumped on the bike and was out. The bike was tough, with all the little hilly bits scaring me a little as I knew what was coming, so I held back a bit to save some energy. It didn’t make any difference though, when I got to the Beacon it still nearly killed me. I haven’t climbed it since before the summer and Strava’s telling me it was a PB of 8:59 so I’ll take that! What goes up must come down though, and I took great delight in setting the 30mph warning light off for my 40mph descent of Coldean Lane. Another (much more fun) PB. It would’ve been faster if I didn’t spend half of it trying to clip back in. I gave up in the end to enjoy the descent but my feet were so cold I couldn’t clip back in until about a km later! Yeah, this wasn’t too much fun. I’ve not been running much this summer, and certainly no hills, having focused on my swim and been faffing about on mountain bikes for most of it. After my navigational flail despite the BIG YELLOW SIGNS and pointing, laughing marshalls coming out of transition 2, I managed to get onto the run course. The run exits transition the other way and heads towards Stanmer via the ramp at the Amex (they make everyone take the ramp instead of the stairs so it’s fair, not that I could’ve hacked the stairs at that point with my knees, mind). There’s a steady climb into the woods and then a short but uphill course through the trees before looping back out and down to the finish. This run was in no way comfortable whatsoever. I couldn’t feel my feet from the bike so spent the first half of it stamping around with pins and needles, then my back hurt on the hills and my lungs begged me to stop. I did, and fell into a forward bend behind the trees as soon as I was out of sight. Good job I’ve got a 10 miler and a half marathon in a few weeks then! I came into the finish to a sea of support from friends, and spent the next half hour gushing about how tough and awesome it was, cheering others in. It really is an awesome race, I’ll be back to smash it next year. You should too. We enjoyed our free tea and free chilli, watched the awards and drove home on another sea of endorphins, already planning the next one. Next Post WIN | 2x race entries to Brighton Color Run!